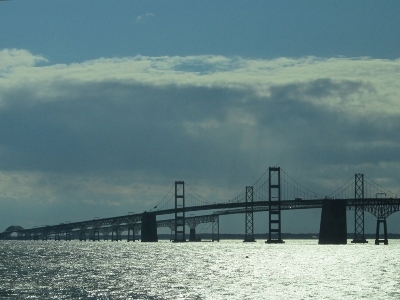 One of the region’s most familiar landmarks, the Chesapeake Bay Bridge spans the estuary from Annapolis to Kent Island Maryland. In 1947, the Maryland General Assembly directed the State Roads Commission to build the bridge’s two-lane original span. The Chesapeake Bay Bridge opened to traffic at 6 p.m. on July 30, 1952. The second span was completed on June 28, 1973. In addition to carrying vehicle traffic, the bridge is a popular outdoor recreation destination. The structure is popular with fishermen, boaters, kayakers, photographers, and others. The structure is also used for sporting events including walk-runs, triathlons, and regattas. Located within sight of the bridge is the Chester River, Kent Island, Eastern Bay, Sandy Point State Park, Sandy Point Shoal Lighthouse, and the port of Annapolis.